If you are moving to a new home from an existing home, you already know the process is going to be time-consuming. You will have to move larger pieces like furniture as well as smaller items. With your smaller belongings, using moving boxes are the best form of packing. Boxes are ideal for safe transportation of your items to your new home. But how many boxes will you need? Is there a certain number you should have on hand to be able to pack up your home for the move? 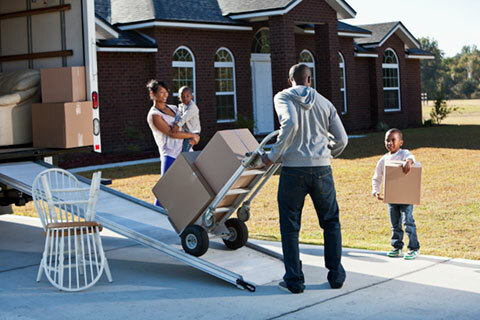 What other moving supplies might you need in order to make your move successful? Which moving tools can help make your move easier? All of these questions and more are answered in our article below! In most cases, homeowners find they need more moving boxes after starting to pack a big move. It can take up to 50 or more depending on the size of your home. Before purchasing any boxes for the move, consider what needs to be packed up. It’s likely best to break down your move by room – smaller segments will allow for a clearer overall plan. By reviewing which rooms will require boxes, you can then get a good idea as to how many you will need. When moving, you can choose to purchase some moving boxes in various sizes to fit your belongings. Smaller items such as dishes and glassware will need to be wrapped for safety and stacked in a medium size box. Larger boxes can be used for clothing, blankets, etc. as they will not be as heavy or at risk of breaking. If you have a moderately sized home, it can be beneficial to purchase 20 to 50 boxes to begin the moving process. You can then add more if needed. Like your moving plan breakdown by room, to start the move, begin boxing up items in one room at a time. Complete packing up the room and move onto the next room once completed. This way, you can finish up packing rooms in your home before you run out of boxes. By working on one room at a time, you have enough packing materials and boxes to at least finish some areas. Should you run out, you’ll be able to re-calculate the number of boxes you’ll need to finish the job – by the rooms not completed. Besides moving boxing, be sure think about what other moving supplies you need for packing. For best results include moving supplies such as packing cushions, utility blankets (to cover large items for preventing damage), tissue paper, wrapping paper, bubble wrap, packing tape, ratchet straps, tie downs and tarps. In addition to the supplies needed to pack and secure your belongings during the move also give thought to how will move your items. There are various tools which could be used to aid your efforts during a move like an appliance dolly, moving carts, and lifting straps or slings. Total Storage Winnipeg provides moving boxes and moving supplies, so you can easily prepare your home for the big move. Besides the convenience of our moving supplies – should you need a storage unit for short or long term needs during your move – we have you covered. For more information about any of our moving supplies or storage units – contact us at 204-832-8181 today!